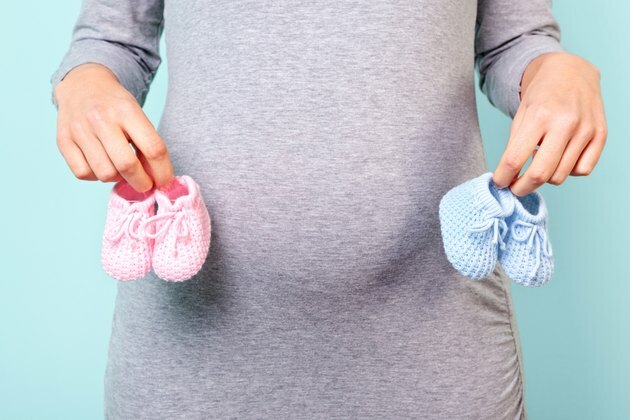 Carrying twins means you'll have double the joy, but you'll also have almost double the belly of a woman carrying one baby, since twins grow at nearly the same rate as single babies. By the time you reach the 24th week of your pregnancy, or the end of your second trimester, your babies will still need more time to grow, but many of their features and organs will be developed. By 24 weeks, each of your twins is fairly close in size to that of a normally developing single baby. One average baby would be around 12 ½ inches long at this point in the pregnancy, according to the American Pregnancy Association, and he would weigh somewhere around 1 ¼ to 1 ½ pounds. When you're carrying twins, they may be around the same length as a single baby but will generally weigh a bit less since they haven't yet developed as much fat as a single baby would. Your babies' lungs are developing during the 24th week of pregnancy. They aren't yet filled with air, but the babies should be making breathing movements to practice for after they're born. Their brains are also growing steadily, as are the pancreas, thyroid and adrenal and pituitary glands. These organs produce hormones. Since the babies still need to gain more weight, their skin is wrinkled while it waits to be filled out by body fat. The skin is also very thin and translucent at this point. Much of your babies' facial features are close to being fully formed at this point. Their lips should be noticeable and their eyes are formed, but the irises don't yet have color. Their mouths are also developing during the 24th week. Their teeth buds, which will one day grow into teeth, are growing inside their gums, and their taste buds are starting to form. Your babies' eyes are also progressing. Their eyebrows and eyelids should have developed by this point in your pregnancy. Gaining the appropriate amount of weight is essential when you have to provide nutrients for two babies. According to the American Pregnancy Association, your weight gain is most crucial between the 20th through 24th week of your pregnancy. By the time you're 24-weeks pregnant, you should have gained around 24 pounds. According to the APA, gaining at least 24 pounds by this point reduces your chances of delivering early. If you haven't gained this much weight, your babies may also be smaller than average at this point in the pregnancy. How Much Weight Does a Baby Gain in the Third Trimester?